Once upon a time, America was full forests and wildlife. Animals like deer, foxes and wolves were a common sight, yet they somehow managed to coexist in a balanced arrangement with man. These days, that balance is all off, with wild animal species being threatened from many nearly all angles. In the U.S., deforestation, pollution, and the unending bloodlust of hunters kills many wild animals each year. Where it was once common to see animals like these in the wild, in many places this is now a rare sight, as humans spread into areas that were once wild. On a global scale, 52 percent of the world’s wildlife have disappeared in the past 40 years – largely, this is due to human activity. 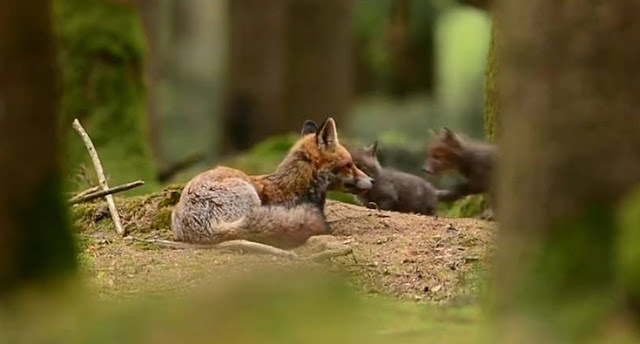 So when Quentin Lenel had the opportunity to post rare footage of a wild fox family enjoying a lovely day in the forest, he did so, to show everyone how beautiful nature can be. This momma fox and her four cubs are out enjoying the day and each other, without fear of humans, a heartwarming scene that is becoming harder to find in the modern world. By conserving our forests and the animals that live in them, we are also conserving scenes like these, passing them along for future generations to enjoy. Responses to "Wild Fox Family Playing in the Woods Will Fill You With Joy And Hope"